Fleetwood, Peter Green, Danny Kirwan, John McVie and Jeremy Spencer) and date from February 1970 when they played three nights at the Boston Tea Party venue. 3 CD Set in round box remastered vintage live recordings of Peter Green's Fleetwood Mac. Earlier this year the current incarnation of Fleetwood Mac embarked on a massive world tour. Dates in North America are being followed by gigs around Europe, Australia and New Zealand. These dates will see the band playing sold-out shows to huge arena crowds and are sure to create another surge of interest in this much-loved band. Boston is a 3CD set which collects live recordings from an earlier era of the band's colourful history. The set features the classic blues line-up of Mick Fleetwood, Peter Green, Danny Kirwan, John McVie and Jeremy Spencer. 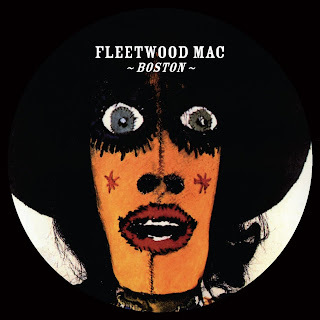 Originally recorded at the Boston Tea Party venue over three nights in February 1970, for a planned release later the same year, these recordings were left in the can, unissued, following leader Peter Green's sudden decision to leave the band a few weeks after the dates. Tracks from the shows were eventually released in various forms in the mid-80s but these releases were blighted by poor sound sources. The discovery of the original 8-track tapes and a number of previously unreleased tracks in the late 90s allowed the material to be re-mixed, re-mastered, and substantially overhauled for release on 3 separate CD volumes. This new set brings together all of these re-mastered recordings a 3CD set to present a complete document of these historic shows. The set is packaged in a round box with a 24 page book and 5 beer mats. The booklet contains new sleeve-notes and reworked artwork. This is "my" Fleetwood Mac: Greenie, Kirwan, Spencer, McVie, Fleetwood. The guitars, the guitar duets, the guitar calls and responses, the slide, the vocals, the songs, the rhythms. This has got to be one of the best rock, blues recordings period. This particular band was at their peak and their end - remarkable. Keith Hyman is right. The incredible churning guitar work, rhythm section and glorious remastering put this set right next to Allman Brothers Band at the Fillmore East as best live blues-rock albums of all time. Try their Live at the BBC album as well!